Solid wood dart cabinet with board and two sets of darts and the logo of your favorite team. Show your support for your favorite team with balls, triangles, covers and cues. Finish off your game room with pub tables, stools, ottomans, side tables and TV trays. 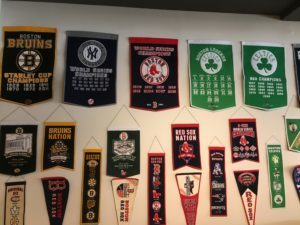 Decorate your walls with various pennants, banners from your favorite NFL, MLB and NHL teams.